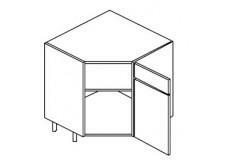 Drawer Line Angled Corner Base Unit, 720mm high, 900 x 900 mm. Drawer Line Angled Corner Base Unit. Requires 1 x door 570mm high x 446mm and 1 x drawer front 140mm high x 446mm and includes 1 adjustable shelf, BLUM Clip on Hinges and adjustable legs.